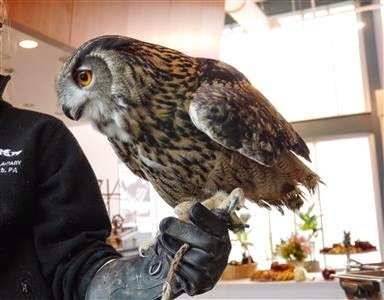 Gandalf the Eurasian Owl (AKA the Harry Potter owl). Gandalf has a 4 ft wingspan. SP & I were fortunate to be invited to a special tasting preview of the new brunch season at The National Aviary. I had never been to The Aviary plus I love brunch foods, so I was pretty excited even though I am not a huge fan of birds. The tasting was this past Saturday and in addition to yummy brunch treats, we were able to enjoy up close visits with a few of The Aviary's residents - my favorite might have been the owl. It was so tempting to reach out and stroke his beautiful fluffy feathers, but one look at his talons and I knew to just smile and keep my distance! Look at that thick glove his handler is wearing! The tasting preview was held in the atrium but when the brunch season officially starts on Easter Sunday, it will be held outside in the Rose Garden under a tent. SP & I started off with Mimosas (there also were Bloody Marys as well as coffee and tea). Penguins are adorable and cute and you just want to scoop them up and hug them (but of course you don't). Happy is penguin #6 born at The Aviary and is 3 months old. Cinnamon French Toast and Potato Pancake with smoked salmon and capers. Roasted Vegetable Frittata con Queso with salsa verde and Chicken Tinga Enchiladas. Thick slices of Bourbon Glazed Ham with mango chutney, Southern Sage Link Sausage, and Polish Kielbasa. My plate of food - quite a large breakfast for me at 9:30 am! SP's plate of food. You can see how different our tastes are! He had the buckwheat pancakes, sausage, and potato pancakes with salmon. I wish he'd put a sausage link on my plate, though, because it was delicious and I ate half of his off his plate. I was stuffed after brunch. The Aviary's brunch is prepared onsite by Chef Josef Karst of Atria's catering. He came out and talked with us. He's a great guy, originally from Germany, and SP & I later wondered if he is the reason Atria's offers an Oktoberfest menu every September/October. He made extra potato pancakes and I ate a few plain (without the salmon/capers) - really tasty! If only I had a larger stomach, I could have eaten quite a few more! Once brunch starts, outside in the heated (if necessary) tent, there will be an egg station with eggs prepared on demand. Brunch starts on Easter Sunday and the next 2 are on Mother's Day and Father's Day with 2 seatings each time (10:30 am and then 12:30 pm). There will be others, but the dates have not yet been announced. Reservations are required, and the cost includes visits from some of their birds. I cannot say enough how amazing it was to be able to be so close to the birds - I think I might be starting to like birds after this experience. I also cannot say enough how friendly all the employees are and how much knowledge they have and how much they share, not just the people who brought the visiting birds to brunch but also as we wandered through The Aviary after brunch. The Rainforest would have been kind of boring if not for the employee who told us all about each bird, their name, their quirks and personalities (some like to chase others, some act up if they feel ignored, some hide) and a wonderful guy told us all about the Bald Eagle and the Steller's Sea Eagle from Siberia. It's clear how much the employees enjoy working with the birds and how much they care about them. Red the Scarlet Macaw was the first visitor at brunch. Beautiful! This would be a great way to spend some time with family, for adults and kids, enjoy tasty food, experience up close visits with some birds, and then walk through the exhibits and maybe even feed a pelican or lorikeet. Many thanks to The Aviary for the invitation. Note: SP & I were given complimentary admission and brunch for the tasting preview, but The Aviary did not ask me to write an endorsement of their brunch/their establishment. As always, all thoughts and opinions are my own.